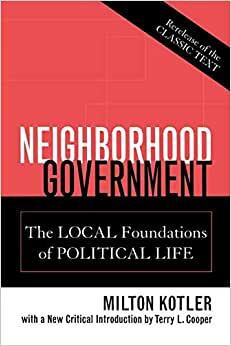 Originally published in 1969, Neighborhood Government continues to speak to American cities whose faces have been radically changed by immigration, urban sprawl, and communities fractured by pervasive economic and racial inequality. With a new critical introduction that places the text within contemporary debates and a new foreword and afterword from the author, Neighborhood Government continues to be a vital work for anyone interested in the economic, social, and political health of American cities and the continuing struggle to increase community investment and control. Milton Kotler received his M.A. in political science and taught political science at the City College of Chicago. A political strategist and neighborhood organizer for twenty years in the 1960s and 70s, in 1982 Kotler organized Kotler Marketing Group (KMG) to develop new funding sources and revenue programs for non-profit organizations. KMG is a leading marketing strategy and practice company with corporate and non-profit clients throughout the world. For the past six years Kotler has focused his strategic activity in China where he works on urban and industrial development for Chinese municipal authorities. His company also provides strategic and tactical marketing support to Chinese companies to improve their business performance in Chinese and global markets.